I've had this research on MBIA sitting on my desktop for some time now, too busy to convert it into a post for the blog. 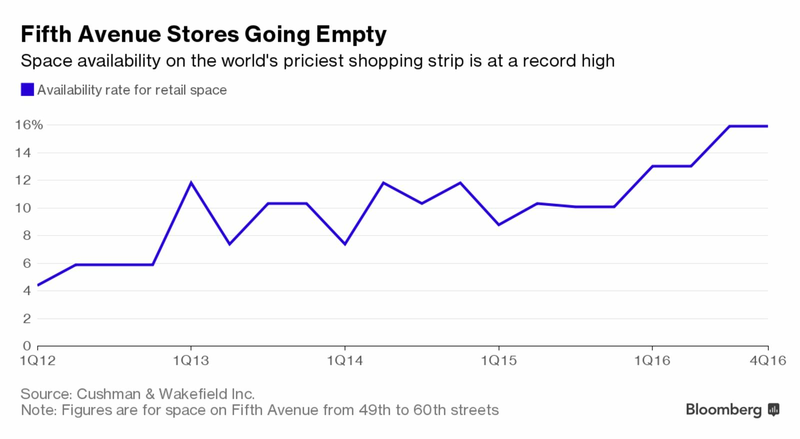 The macro situation stemming from the real estate bust is unfolding just as I have surmised, albeit a bit quicker and more far reaching than I originally thought. It is scary, for nobody wants to see bad things happen to other people, and I don't want to get caught in a financial downturn regardless of how well prepared I try to make myself. On the other hand, these situations create significant opportunity for gain, primarily from those who refuse to acknowledge the fact that the wave is not only coming, but has reached us quite a while back. I have learned unequivocally what many probably new for some time now. What is that you ask? You really just can't trust government data. Now, I don't want to get into politics and conspiracy theories, but the data as of late has been so far removed from the obvious reality for many that it is almost signaling that the government doesn't even want you to heed the data and is giving you the requisite warning signals. Examples of which are employment data and inflation. Alas, and as usual, I digress, as such is the mind of insane idiot savant that my kids call Dad. Now, back to the title - What so special about the number 104? It is the number that will probably scare the pants off of anyone who is in equity investors, or potentially anyone who is a customer, of MBIA's insurance and guarantee products. It is the number that when reached, will leave the equity investor with shareholder certificates worth nothing. It is the number where MBIA's equity is wiped clean. Why are you being so damn cryptic Reggie, you ask? Because, I need for you to go through this history of how we came to this point before I explain in detail, so as to get a clear and comprehensive understanding of the situation. That is part of it; the other part is just because I feel like it. Now, let me give you a little cartoon of what the number is, then a background of how we got in this mess to begin with, then an analysis that shows how I got to this number. As usual, you can click on any graph to enlarge it. Some time ago I came across this report on the MBIA and ABK by Pershing Square and found it absolutely intriguing. I posted it on this blog on September 3rd, when these companies were trading in the 60's and 70's roughly, and respectively (sometimes it actually pays to read this blog:-). I was actually impressed enough to take a small short position of my own without doing my own forensic analysis. This is something that I regret. Why? Because I am willing to assume significant risk once I convince myself of the strength of a position. Using third party research, I dabble at best - and rarely do I use third party research. So, I dabbled when I should have looked harder and took a significant position. After the fact, I looked further into the industry on an anecdotal basis, then all of a sudden, Bam! The proverbial feces hit the fan blades. The stocks fell so far, so fast, I was taken aback. 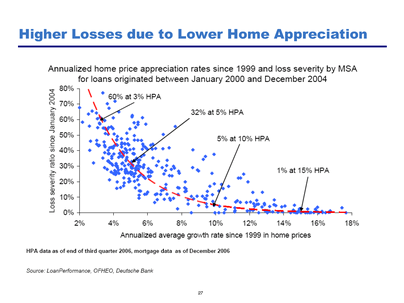 So, I asked part of my analytical team to take a look at these guys, for I knew that a major problem the monolines, the banks, and the builders all had was a lack of understanding and respect for the rate of decline in value and default of instruments linked to bubble real estate - combined with excessive leverage. So they took a cursory look for me, and they pretty much confirmed my suspicions, but it is not straightforward. There conflicts of interest issues that goes far and wide. So much so, that I will most assuredly not be making anymore friends with this blog. Many of the financial professionals know this, but the layman may not. What's wrong with the ratings agencies? Rating agencies assume limited historical correlation (20%-30% for sub-prime) will hold in the future (we've heard this line before) as the credit cycle turns (it is obviously turning now), correlations could approach 100%. Just imagine if the ratings agencies are as accurate with their opinion of MBIA as they have been with their opinions on the securities that MBIA insures. Look out below!!! Smaller advisories, coincidentally those that do not receive significant fees from the monolines and their customers, have a different take on the monolines. Take Gimme Credit, for example. Gimme Credit downgraded MBIA's bonds to "deteriorating" from "stable" earlier last week, citing the potential for write downs. They also stated that the other major agencies should have done so a while back. CDS market has also moved against the big monolines. I know everyone has an opinion, but the problem starts to look like a problem when you can prognosticate the opinions based on the incestuous nature of the money trail. To be fair to the big ratings agencies, they dance a precarious line. If they do downgrade the monolines, they, by default, downgrade all of the bonds and entities that they insure. 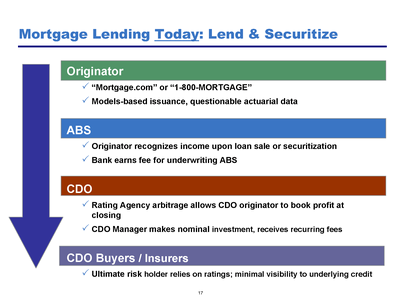 That is not just mortgages and CDOs, but municipals, hospitals, etc. This ripples through various investment funds, government funds, the whole nine yards. Then again, it really doesn't look good when the companies that don't get fat fees from the insurers and their clients are so much quicker to downgrade than those that do. So they are damned if they do and damned if they don't. Then again, there a fair share of boutique research houses that say that it would take an extremely fat tail and near 100% correlation amongst the insured securities to cause failure in the monolines. Well, have you ever been to Tasmania? Tasmanian devils have very fat tails, as well as a whole host of other animals such as fat tailed skinks and occurrences with a 1 in 2 million chance of happening such as the outlier that took down LTCM. You see, when everyone is leveraged up, and there is one door when someone yells fire - it is going to get awfully crowded around that exit. Call it correlation, call it common sense, call it whatever, but I think we will soon be calling it a foregone conclusion. These fat tails don't have to be as fat as the financial engineers think they have to be. 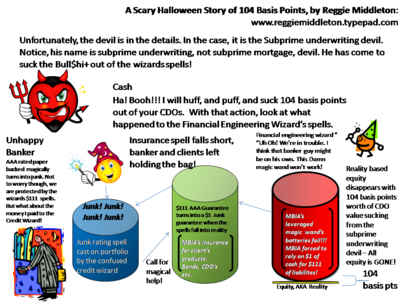 As for the 100% correlation, well that was briefly mentioned in the bullet list above, but from a common sense perspective, as the subprime underwriting really takes effect (what we have seen thus far is just the start), everyone in leveraged instruments (i.e. everyone) will start running for the exits at the same time - hence 100% correlation. I figured this one out without a model, nor a Financial Engineering PhD. I know there are those who disagree with me or may think that I don't know what I am talking about. Well, a few months will reveal one of us to be wrong. Somehow, I don't think it will be me. Channel Re is a Bermuda-based reinsurance company established to provide 'AAA' rated reinsurance capacity to MBIA. Renaissance Re Holdings Ltd, Partner Reinsurance Co., Ltd, Koch Financial Re Ltd and MBIA Insurance Corp are the investors in Channel Re. MBIA has a 17.4% equity stake in Channel Re and seeded Channel Re with the majority of its business. Channel Re has a preferential relationship with MBIA. Channel Re has entered into treaty and facultative reinsurance arrangements whereby Channel Re agreed to provide committed reinsurance capacity to MBIA through June 30, 2009, and subject to renewal thereafter. Channel Re assumed an approximate of US$27 bn (par amount) portfolio of in force business from MBIA Inc and has claims paying resources of approximately US$924 mn. (source Renaissance Re 10K. Swapping Paper Losses Channel Re is insulated against huge losses because of adverse selection in terms of pricing and risk on the assumed portfolio of MBIA. The agreement between the Channel Re and MBIA protects channel Re against any major losses. This financial reinsurance scheme smells a little fishy. Is MBIA dumping mark to market losses on Channel Re through reinsurance contracts? Haven't we learned how dangerous leverage can be? Do you remember my exclamation of the incestuous relationships? There is the moral hazard issue of everyone getting paid up front except for the ultimate risk holder. 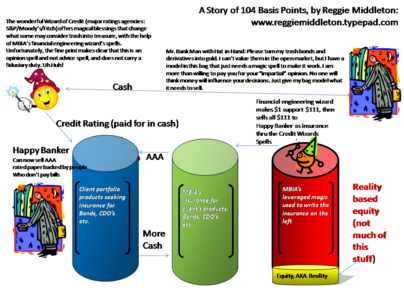 They only get paid of the deal closes favorably, and banks go ratings opinion shopping for the desired results - very similar to the residential real estate boom where brokers went shopping amongst appraisers to get the blessed number that they desired. Without that number, the appraiser/ratings agency just won't get paid. Fairness opinion fees are only really not that synonomous with fairness, since the grand arbiter of fairness is the guy that paid to get the deal done in the first place. Reputational risk exists when opinions are changed quickly. They do not want people like me asking why a tranche can go from AA to CCC in a year!!! I think what companies such as Fitch are figuring out is that reputational risk exists in greater part when opinions are changed too slowly and are questioned by pundits publicly in the face of failure. 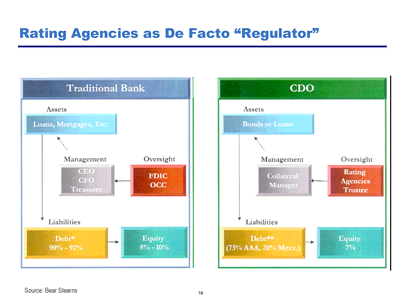 I have noticed that Fitch has gotten much more aggressive than the other two major agencies. There are several other reasons, which I won't go into here, which are bound to lead one to believe that conflicts of interests are rampant. So, if I am right, and the insurers are wrong, what happens as default rates increase? The 7 graphics immediately above are from the Pershing Capital Report linked above. Monoline insurers make a very unique counterparty. Unlike guidance of traditional ISDA contracts, and unlike traditional insurers, financial guarantors don't put capital up front, they don't post additional capital in the case of contract value decline, and need not post additional capital in the case of an adverse change in their credit rating. 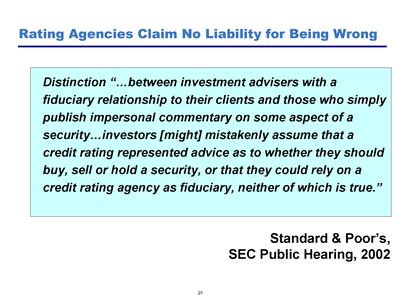 MBIA is woefully undercapitalized in the event of a major mortgage security default event, despite the opinions of the large ratings agencies. Look at the graph and use common sense. 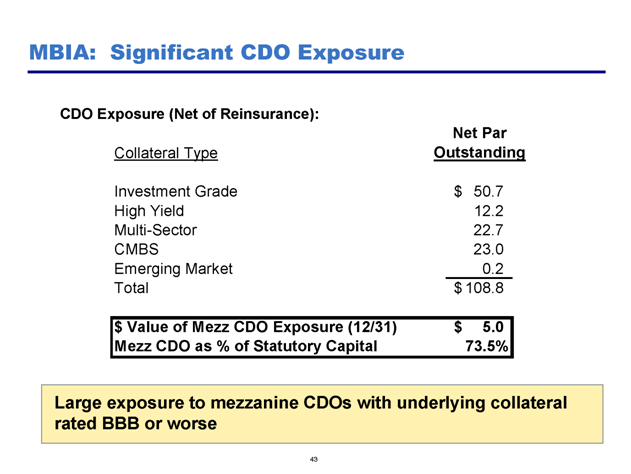 As of Q3 of 07, they had approximately 35 basis points of unallocated reserve to cover net (of reinsurance, see the redundant risk through Channel Re note above) par outstanding financial guaranty contracts. 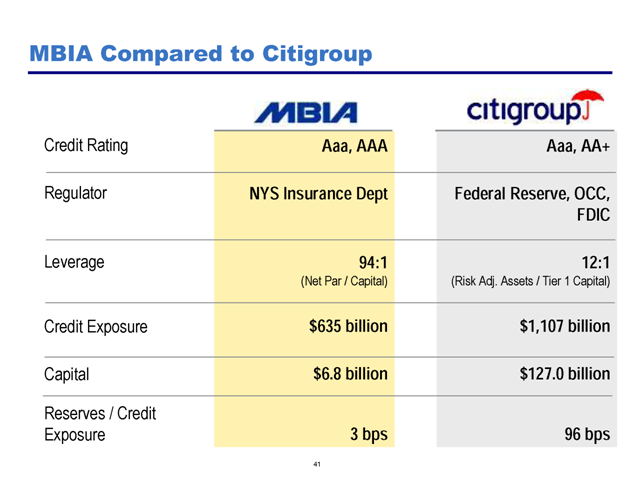 Put in lay terms, MBIA, after buying reinsurance to cover itself for potential losses (some of which it has actually bought from itself), has 35 pennies to pay for every $100 of risk protection that it sells to its customers. This is cutting it thin, no matter which way you look at it. Particularly considering how reliably the subprime underwriting of the recent boom has caused defaults to occur, uniformly and with increasing correlation across multiple and historically disparate underwriting classes. Now, this 35 cents of protection coverage for every $100 of risk translates to extreme leverage. If you think the hedge funds took excessive capital risk due to leverage, you ain't seen nothin' yet. 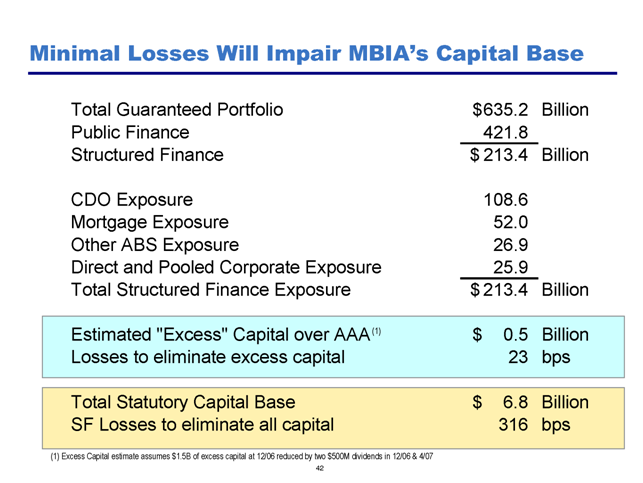 MBIA easily sports 100x plus leverage for the last quarter or two. MBIA has increased exposure to Structured Finance during period of rapid innovation and lower lending standards. 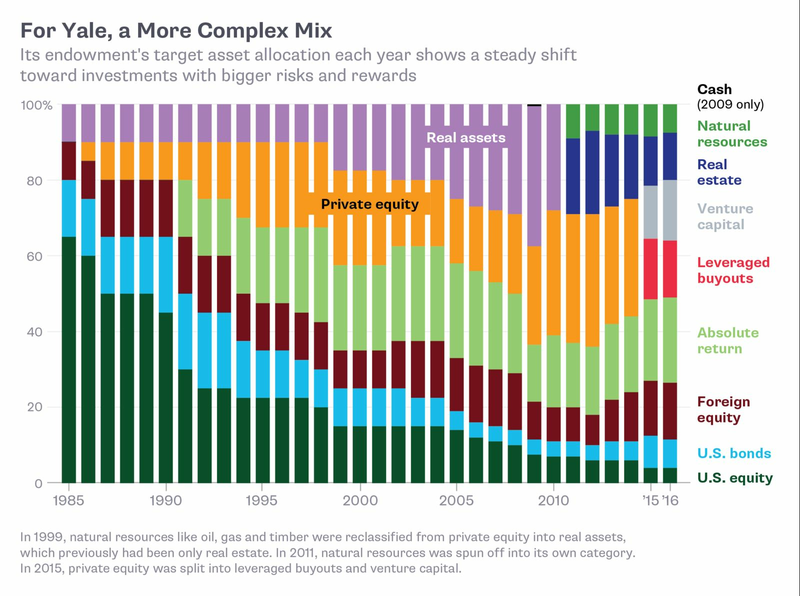 It's structured finance exposure has increased along with all of the other housing sector related companies during the boom, more than doubling in the last ten years. 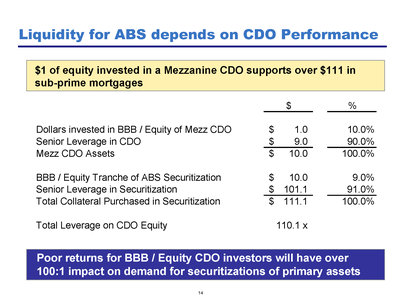 So, an increase of 104 basis points in CDO spreads wipes out the equity of MBIA, TOTALLY wipes it out. To put this into perspective, let me show you the entire sensitivity grid. Hey, no matter which way you look at, these guys are at risk. They have $6,800 in capital. Just move your finger over any combination of CDO duration and spread in basis points, and if you come close to that 6,800 figure, bingo! The current duration average is approximately 5 years. So the question is, "Will spreads reach 104, or more?" Well, look at the charts above that I posted from Pershing. 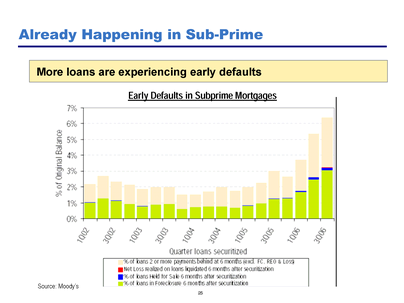 Better yet, look at the subprime underlyings performance, which can be mimicked by the ABX from markit.com. Horrendous, indeed. So, in a nutshell, despite the significant drop in MBIA's share price, it is still trading at a 55% premium to it's mean adjusted book value comparable price. Resigned (2/16/07): Neil Budnick, President of MBIA Insurance Co.
Is it me, or do they have a vacuum of experienced management approaching? Worse yet, did these guys know something that we should be aware of? 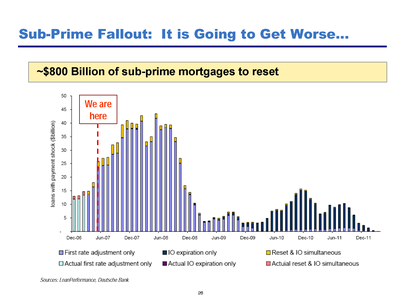 After all, looking at the graphs below, the industry is going to run into some rought subprime underwriting times! A third of MBIA's revenues stem from abroad, primarily in Europe. Most of the action in Europe is in the UK PFI market. These bonds finance roads, schools, rail projects, tunnels and public buildings. Italy, Spain, Portugal and France are also on the bandwagon. Niche sectors such as non-conforming mortgages in the UK (and possible Spain) are particularly susceptible, primarily for the same reasons they are here in the US. Over building, overvalued housing stock (particularly the UK, Spain and Ireland), lax (subprime) financing, and declining property values under loose regulation. It definitely will not help the European insureds if MBIA gets downgraded or CDS spreads widen considerably.